Happy Friday loves! Hope you had a wonderful week. This week was a little rough so I'm glad it's over! Luckily I'm working from home today too which always helps. Do y'all have any fun plans for the weekend? Saturday we'll be watching the Clemson game and Sunday I'm going into DC with one of my best friends (and MOH) to go to the Smithsonian museums. Living right outside of DC, I feel like a lot of times I take it for granted. I want to try to do more fun things in the city while we still live here! I got this poncho because one of my best friends works with Cabi and she told me their new Fall Collection was great! I saw this poncho and knew I needed it. It is SO cozy and perfect for fall days outside. It's probably at the point here in Virginia where it's a little too cold to not wear a coat unfortunately. For those of you with more mild weather this time of year, this poncho would be perfect! Hope you all have a fun and relaxing weekend! Ponchos are so warm and cozy! This one looks like it'd be the best of both! 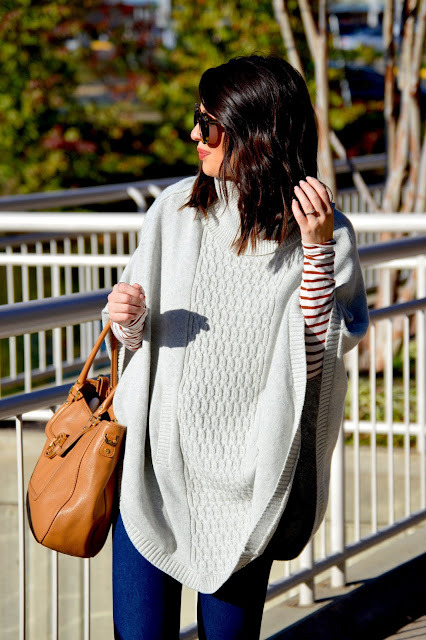 What a cozy looking poncho and I love how you layered it with the stripes! Have a great weekend! What a fabulous poncho, I adore the cableknit detailing on it! You look so stinking adorable girl I hope you have a most wonderful weekend, I hope it is as sweet as you are! It's been mild lately here in the UK so that poncho would be perfect for right now. Looking lovely as always hun. I'm off to a wedding on Saturday. Enjoy your weekend. Great poncho and I'm loving the silver metallic flat. Such a cute look. This poncho looks so cozy, Kelly! I love the length, cable knit detail in the middle and oversized turtleneck; this poncho screams fall! I also love the purse you paired it with, as well as those fabulous silver flats! Great styling, as always, beautiful! I hope you have a wonderful time watching the game and exploring the museum! Kelly, what a cozy and chic look!! I love that poncho sweater and you did a great job of styling the rest of your look. Thank you for sharing and have a wonderful weekend! Super cozy & chic look on you! Enjoy your time in DC! I went to school there and miss it all the time. Georgetown was my favorite place to shop, so any time I go back I stop at Martin's Tavern for lunch and then get gelato at Dolcezza. 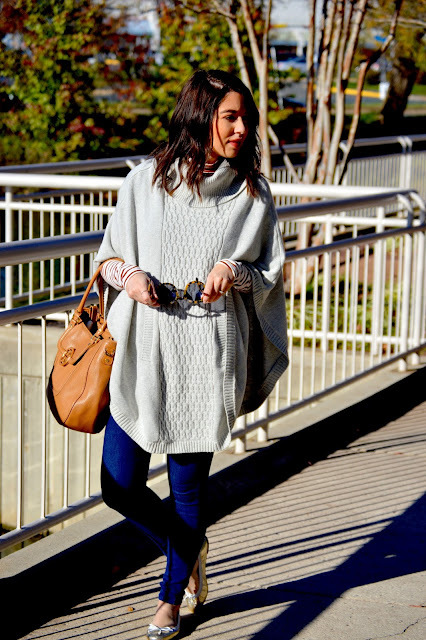 Your poncho is perfection and it looks so cozy! Love your poncho - looks so cozy & cute! Hope you have a great weekend lady! Love, love, love the stripes under this poncho! I love the cable knit on that poncho! And the stripes sleeves peeking out are too cute. Holy cannoli that poncho looks comfy. Pretty! The epitome of cozy chic! I've always loved the look of ponchos but never quite looked good in one. Too bad now that I've moved to Boston, I can't really get away with wearing these this time of year! Such a cute outfit, I love this poncho, and the way you styled it is gorgeous! Hope you have a great day! The stripes are too cute with that poncho! Love this look - that poncho is so cute!! I just got a check for over $500.